More Facebook Everything is exactly what you need to skyrocket your Facebook followers. Learn how to get targeted followers and convert them into sales for your business. This great book will show you everything you need to know and by following the simple steps and putting them into action, you are almost guaranteed to increase your traffic and sales. Grab Your Copy Today!!! Do you want to discover the proven secrets to get 1000's of Facebook followers to FINALLY skyrocket your earnings with your own Facebook Page? Do you know that Facebook has over a BILLION users that could potentially become your customers? Are you still waiting, but nothing is happening? You don't have enough targeted facebook fans for your page! In order to make real money using a facebook fan page, you need fans - and A LOT of them! Luckily, you have stumbled across this page today, because More Facebook Everything is going to show you how you can finally drive more targeted fans to your page that will be interested in what you have to offer. * How to harness Facebook Ads effectively for FLOODS of fans. * How to use Social Media and Social networking sites for more targeted fans. * How to use Viral Videos for huge amounts of fans. * External websites that you should use to skyrocket your fans and profits. * How to use plugins to increase your fans ten fold quickly and easily. * How to use Outsourcing sites to dramatically increase your fans for cheap. You can see that More Facebook Everything is the complete package you have been waiting for. Follow the simple step and you are almost guaranteed to increase your traffic and sales. It's easy to see how this great course will benefit your business if you grab it today. "Yes! I really want to discover how to get more facebook fans, faster and get tips, hints and secrets that will give me the edge in social marketing. 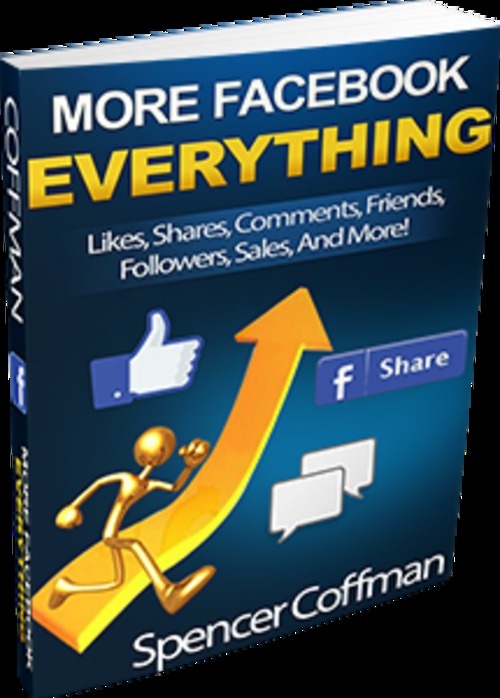 So please send me my copy of More Facebook Everything - so I can start getting more targeted facebook fans and finally making bigger profits, starting today!